I first encountered Dallas Hudgens when I moderated a panel about con-men in fiction on which he appeared for the Virginia Festival of the Book. I’m not usually inclined toward the genre, so was most pleasantly surprised to find I could not put down Dallas’ novel, SEASON OF GENE. It’s the story of a sad-sack group of scammers and wise-guys whose losing weekend baseball team is drawn into the ultimate scam when their esteemed slugger Gene dies of a massive coronary while sliding into home. Upon his death they learn that Gene has in his possession a priceless bat once used by Babe Ruth, the sale of which could pull Gene’s wife and their shared businesses out of the load of debt they hadn’t known Gene left behind. Only problem is a whole lot of unsavory types also want to get their hands on the bat. Season of Gene takes you into the seamy underbelly of a world peppered with surprisingly lovable losers. The writing is compelling, the dialogue snappy, and I can’t help but urge you to check out the book. 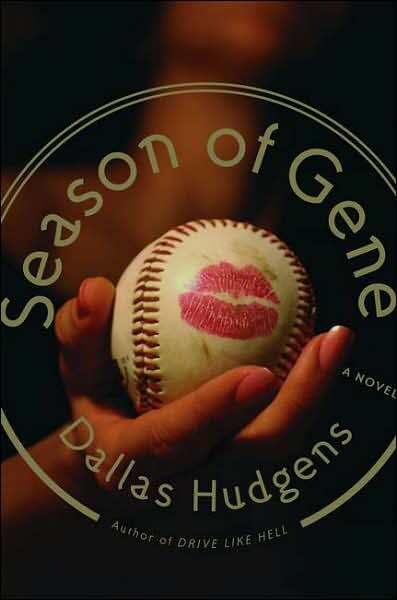 And some lucky reader will have the chance to read Season of Gene, which Dallas will give away to someone who posts a comment today. In addition, he’s got a copy of his first novel, Drive Like Hell to give away as well. Dallas decided to take this week’s theme on Motherhood and run with it, penning a poignant short story featuring a mother. Without further ado, please welcome Dallas Hudgens. “Which one is most like your husband?” he asks. They’re sitting on a bench together watching her three sons have their way with the playground; the oldest quietly digging holes in groups of four, the middle one organizing a game of tag with two other children, and the youngest running around like he just dropped a hot horseshoe, screaming and chasing squirrels. The youngest boy falls and starts to cry. She cleans him up and comes back to the bench. The sunlight warms his face, but the rest of his body is chilled and confused. He’s three days out of a court-mandated drug rehab and can’t remember the season. His head is full, and he’s afraid that something might spill over the sides. He turns and looks at the side of her face. He feels her resisting the urge to look at him. The memory of her soft eyes is a light that he has carried for a long time. He mentions his grandmother, smoking cigarettes and playing records for him when he was little. She’d sing along to ‘Jackson’ while he banged on his toy guitar. His mother would sit on the sofa laughing. “It’d be nice if we could do this again sometime,” he says. He realizes he shouldn’t have said it. That kind of suggestion has to be understated, like a steel guitar. A breeze stirs, and he grips the painted wood on the bench. He feels as if he might fall over. His balance isn’t good these days. She leans forward, stuffs a child’s jacket into a backpack. The line of hair tracing her jaw makes his heart tip to one side. She zips the bag and finally looks at him. She tucks her hair behind an ear. “I know,” she says. “The fever was my fault,” he says. He nods. He waits on the bench. A pair of clouds take turns blocking the sun. A damp breeze carries the smell of dirt. Another woman walks through the gate with two girls and a dog. He thinks to pet the dog, to close the gate behind the woman, but he doesn’t move. He stays right where he is supposed to stay. All of the holes are dug. I would love to win a copy of this book. Thanks so much for this opportunity! Wow, your books sound really intruiging AND fun. Hey Dallas! Thanks again for coming today and also for writing us a short story! Whoever wins the books is lucky cause he’s a terrific writer! I’m in. Thanks for the story. Gotta go hug my kid after that. Wow, wow, wow! Great story. I love what you did with our topic and you’re obviously hugely talented. Thanks for coming, Dallas. BTW, can we find other short stories of yours around in anthologies, etc? I love short stories- but I am not great at writing them. The writing is always so tight. Impresses the heck out of me. Thanks for coming to The Ball! Jess asked me to comment, so I said, “Sure! Why not.” SEASON OF GENE looks great–enjoyed your story as well. Loved the ending of this story, Dallas! And welcome to the debs. Looking forward to reading your book. There is always something good here. Pick me!